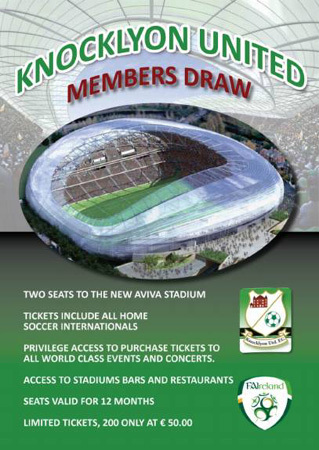 Knocklyon United is holding an annual raffle for the use of two premium tickets for the new Aviva Stadium. The draw is exclusive to members or affiliates of the club. The winner of the draw will win two seats in the Aviva Stadium for all home soccer internationals for one year. The winner will also have privileged access to purchase tickets to other events and concerts at the Aviva for the year. The draw is limited to a maximum of 200 tickets at a cost of €50 each. This is great way to help with the funding of the club while having the opportunity to win a fantastic prize. Anyone that buys a ticket this year will be guaranteed the right to buy a ticket in next year's draw. they are associated with the club. So if €50 is too steep for you why not pool your resources with a friend or two and help to support your local football club? To avail of this limited opportunity please contact your team's manager or contact the club directly by email today. Draw Takes Place at Family Day - Saturday 12 June 2010. There will also be a nursery 5 a side tournament & the usual barbecue. This family day is open to all members of the Knocklyon community and Knocklyon United FC. Please note this is an alcohol-free event. The season is now effectively over but there are a couple of housekeeping issues to tidy up. There is a balance of €170 in the training fees kitty. Unless there are any objections we propose to use this for a modest event / get together for the team to sign off the season. Please contact John by text if anyone has a problem with this. Details will be sent by text as soon as arrangements have been finalised.